Man, tell me about it! 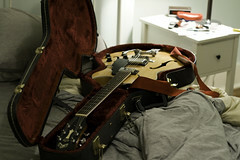 Remember when I actually installed a Bigsby tailpiece on my Gibson? Yeah, I was thinking about that at the same time as I was trying to fix my guitar. It's not a bad decision in general, but whammy bars/tremolo arms do seem kind of unnecessary for the type of music that I play and enjoy. At least you've got a tune-a-matic bridge, if I recall correctly.